“Merry Christmas.” That’s the phrase most commonly used this time of year, but the season sure has a way of highlighting the misery in our lives, along with the merriment. We become acutely aware of what we have and don’t have—which aspects of our lives have improved and which have gotten worse since the Christmas before. Adults are particularly good at this, but children learn it at an early age, too, especially when it comes to expectations and presents. Even when I’m not feeling particularly sad in the moment, Christmas and the New Year have a way of prompting me to dwell on what has been sad in my life. I guess there’s something about seasonal traditions that unearth memories, and something about memories that bring to mind those much darker times in my life: unhappy Christmases during my first marriage, those years I did my best as a single mom, and how I still spend every other Christmas without my girls, so they can be with their dad. I probably shouldn’t even be thinking about those things this year, though. After all, I’m sitting at my parents’ house in Michigan, with Jason and all three of our girls. My brother is here from Portland, too, and I will get to spend time with both of my grandmothers. On Christmas Eve, Jason’s parents, sister and nephew will drive from Chicago to my parents’ house. How many couples get to bring together both of their families for the holidays (and can honestly say they’re looking forward to it)? I feel very blessed right now (and just wish there was a less-trite way to say that). I still feel that encroaching darkness, though, so I’ve finally decided it’s OK to give it a curt nod, one that says “I see you there, darkness, but I will not embrace you.” Because yes, the light does overcome the darkness, but it still seems important, somehow, to acknowledge that darkness at Christmas. It helps us more fully acknowledge and celebrate the light. Maybe that’s really what this season is about—not just the bridge, God’s grace through Jesus, but also the chasm itself. 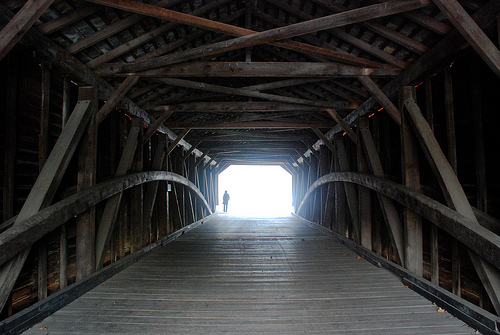 Without the chasm, after all, there would be no reason to celebrate what bridges it. There would be no need for a bridge at all. And that’s what the joy we sing about requires, too: darkness, fear, a chasm. My mom mentioned the idea of joy to me this morning, in reference to an Advent devotional she recently read. We typically use the word “joy” to express happiness that rises above average, but the devotional pointed out that the biblical use of joy tends to involve some darkness, at least in the background. Joy isn’t just happiness, it’s happiness that emerges out of the darkness and fear. It’s what the shepherds were feeling when the angels appeared, bringing good tidings of great joy. And think about what the teenager Mary must have been feeling when she first held her baby. Just a day before, she had faced a chasm, knowing Jesus was about to be born but not having a room for privacy and comfort, let alone an experienced mother or sister there to help her through the ordeal. I’m thinking if true joy requires a nod at the darkness, we should try it, and see what happens. I think just writing this post, rather than pretending to ignore the darkness, has already helped me to really see and appreciate the light of this season. Amen Kristin & blessings to you this Christmas. I have kissed the darkness that nearly threatened to pull me down and came home from the bone marrow transplant with a simple prayer request; to feel real joy. Ten years later we Harlows know how to celebrate. Christmas is no exception. I know what the alternative is, so for today we choose to embrace what God has given us today and to thank him for what he has blessed us with in the past. I prayed for joy and we adopted the happiest, funniest, most loving boy imaginable. Our daughter turned 11 and her kind soul gives me hope for the future. I had an an anonymous woman donate her marrow to save my life. Last but not least I have a husband who was true to his vows for “in better & worse, in sickness & health”. Acknowledging the darkness is taking stock in what has transformed my life, but I have found true joy is rooted in God’s perfect light, his marvelous gift of hope he gave so many Christmases ago. On the edges lurk the fear of cancer returning or the latest med reduction failing again, but for today I will celebrate and watch out Christmas, here I come! Nice timing! A few months ago, I had a thought about two rooms – one in complete darkness and one in complete light. When the door between the two rooms is opened, the light floods into the darkness, but the darkness doesn’t impact the light. To further the analogy, I was just reading a book that connected some dots for me. If you have two rooms – one with love and one with evil . . . when the door is opened, the love will flood into the evil room, but (again) not vice-versa. And therefore darkness and evil are nothing more than words that describe the absence (or varying degrees) of lightness and evil. Isn’t that cool. I like that perspective a bunch. This is such a hard lesson to learn for me. That joy (and, by extension, so many other wonderful experiences) requires something negative – darkness, evil, pain, etc – to fully accentuate it. To truly appreciate the splendor of anything, often we must intimately know it’s opposite. Very encouraging, thank you KT. Very nice post, Kristin. Merry Christmas!! Have a Christmas full of joy in the Lord! Prayers for those that are experiencing sorrow. You’re hitting on a very good point — we need the darkness to help us realize just how wonderful the light is. We just have to be careful to keep the darkness from consuming us. You’re right to give it a nod, and then send it on its merry way. Merry Christmas! Elaine, I’ve said it before, but I need to say it again: Your story always amazes and inspires me. You understand what it means to celebrate and experience joy more than just about anyone I know. Many blessings to you and your family this Christmas! Dave, I love it when several of us seem to be mulling over the same ideas at the same time, turning them over in our minds and eventually sharing them with each other so we can all grow from the collection of insights. Thank you for connecting more of the dots, and sharing of yourself here. I hope you have a very meaningful, joyful Christmas. Cynthia, it is amazing “how God talks in a theme to a number of people at once” (and I love how you worded that). You bring up a really important point: the alienation of people who are not feeling full of gladness. I opened a tab with your blog post and am looking forward to reading it! Thanks for letting us know about it, and Merry Christmas. Jeb, you nailed this: “To truly appreciate the splendor of anything, often we must intimately know it’s opposite.” And yes, it’s a very hard lesson to learn. I suspect we’ll be struggling with it most of our lives, but I’m very glad we can be encouraging to each other along the way. Merry Christmas, friend. Dave, yes, when it comes to the darkness not overcoming the light, but the light needing some darkness, there seem to be analogies all around us, embedded right into creation. I’m so thankful our eyes are opened to it every so often. The Modern Gal, yes, that’s the trick, isn’t it? Not letting the darkness consume us. We see the results of that all around us, too, don’t we? I guess we have to be on guard and try to let the light shine through us onto others as much as we can, to help keep the balance. It’s funny how much this post has resonated with me and how much it made me notice how we all seem to experience the darkness and joy at this time of year. I always do and have always assumed that I was the only one. It’s interesting for me to think of this on a much larger scale. Thanks! Nicola, maybe part of what you are saying (I’m guessing) is that even mostly happy people (still in their marriages, without significant hardships, etc.) feel the darkness? Maybe that feeling is more universal than we would expect? Thanks for giving me a glimpse of a bigger picture, too.